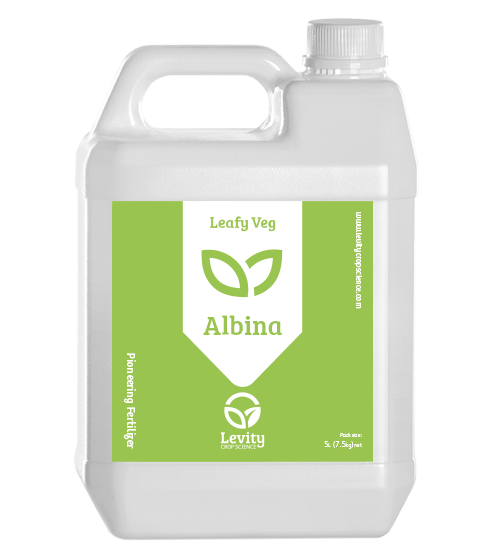 Albina for Leafy Vegetables is a pioneering new product that reduces tip burn and improves quality and shelf-life of leafy vegetable crops. Albina works by helping crops absorb calcium, a nutrient that can improve quality and shelf-life but is poorly absorbed and distributed by many leafy crops. Albina uses Levity’s pioneering chemistry, to stimulate calcium absorption where conventional products cannot. it will help lettuce, chinese cabbage and salad crops producers reduce tip-burn, increase shelf-life and reduce the risk of disease to higher standards using very low inputs. Why is Calcium Form Important? Calcium gives strength to cell walls, protecting them from infection. Calcium stabilises the ‘glue’ that holds cells together, giving firmness. Calcium is needed to create new cells when fruit and flowers are setting. Calcium is used by the plant to protect against stress. Calcium in cell tissue prevents physiological disorders. Application Rate: 1 l/ha foliar spray at 14 day intervals from 3-leaf stage.